Properties in Pienza average 4.7 out of 5 stars. Villa PoliFlora is a modern apartment in Monticchiello of Pienza in Tuscany. Property 4: Villa PoliFlora is a modern apartment in Monticchiello of Pienza in Tuscany. Property 39: Charming And Well Decorated Apartment In The Centre Of The Town, Amazing View ! 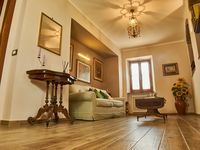 Very cute apartment in the core of Montepulciano and at the feet of the main sq. Property 40: Very cute apartment in the core of Montepulciano and at the feet of the main sq. Property 46: Two bedrooms shining and fresh 140 apartment with free public parking. Davide and Raffaella&rsquo;s apartment in charming Montepulciano was perfect. It was spotless and Davide greeted us upon arrival. The only hitch in getting there was a street that was blocked for construction. Even though we were in the historic part of town (very historic), the apartment was very modern and well- designed. We would love to return to this beautiful area and would definitely stay here again.